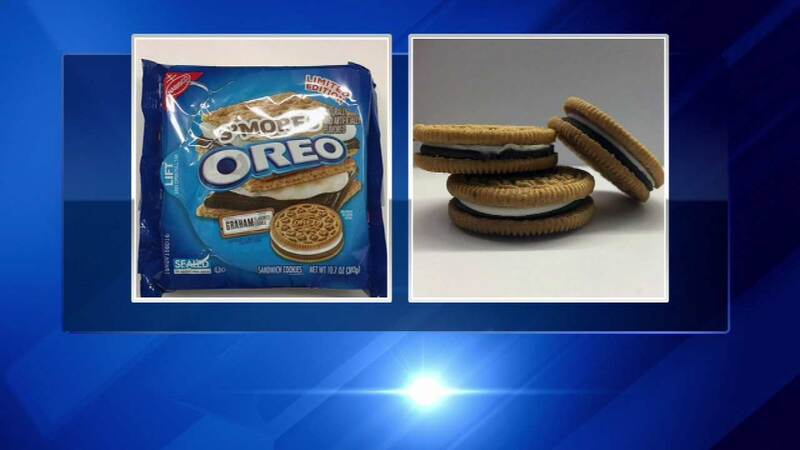 CHICAGO (WLS) -- You don't need a campfire for these new cookie treats: Oreo, which has produced its iconic chocolate-creme cookie for more than a century, is introducing S'more-flavored cookies. The new flavor, with a graham-cracker outside and a chocolate-marshmallow filling inside, hits store shelves Friday. The new flavor will be released on heels of the news that Oreo's manufacturer Mondelez International is cutting hundreds of jobs, including up to 600 in the Chicago area, at a bakery that makes Oreos. The National Biscuit Company sold its first Oreo cookies to a grocer in Hoboken, New Jersey, on March 6, 1912. http://abc7.ws/1JWX0tN Kraft Foods now sells Oreos, the country's top selling cookie. In January of 2014, Nabisco launched two new Oreo flavors - cookie dough and marshmallow crispy. The cookie dough variety looks like traditional Oreos but with a cookie dough filling. And the marshmallow crispy variety is made with the "golden" vanilla cookie and has a creme center that features bits of crisped rice. Oreo has experimented with new releases in recent years. In June of 2013, Nabisco came out with a watermelon-flavored Oreo cookie. Oreo fans had mixed reviews of that cookie. Nabisco says it choose watermelon because it was a fun, summer flavor. In September 2012 in honor of Pride month, Kraft Foods gave its Oreo cookies an online makeover. The company posted a photo of an Oreo cookie stuffed with rainbow-colored layers of frosting with the caption, "Proudly support love." The posting drew many positive comments and "likes," but some Facebook users pledged to boycott the cookie.